In the last decade much attention has been paid to understanding and diagnosing Sarcopenia, the loss of muscle mass that results from the process of aging. 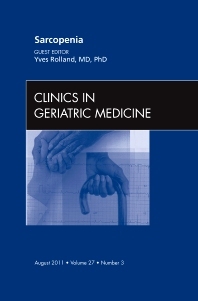 This issue of Clinics in Geriatric Medicine, Guest Edited by Yves Rolland, MD, PhD, covers the History of Sarcopenia and works to define Sarcopenia based on recent workshops and meetings on the topic. This issue also covers the Epidemiology, Physiology, and Consequences of Sarcopenia. Also included are studies on Sarcopenia and Obesity, Sarcopenia and Frailty, Nutrition and Sarcopenia, Physical Activity and Sarcopenia, as well as a look at Clinical Trials on Sarcopenia.